This is part 3 of a series of posts about our four-day trip to the Victorian countryside. 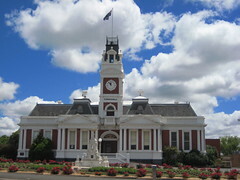 Leaving Ballarat, we head on to Horsham, through a scenic tour of Ararat and The Grampians. We left Ballarat early. After a quick stop at the bank and stocking up on provisions at the nearest Aldi, we drove under the Arch of Victory, passing the elm trees planted along the road, commemorating all the soldiers from Ballarat, who died in the war. Though Horham is less than 200 kilometers away from Ballarat (about 2 1/2 hour’s drive), it took us almost a whole day’s worth of driving to arrive at our new home for the night. You see, instead of driving directly to Horsham, we took a scenic drive that took us through the Wind farm, the small town of Ararat, and Halls Gap, where we were introduced to Gariwerd. The Grampians is this rocky mountain range, whose peaks are made of sandstone. It was believed that 300 million years ago, the area east of the ranges were underwater. Hence the presence of sand on mountain ranges that are 250 miles inland. The Grampians was given its name by Sir Thomas Mitchell after the Grampian Mountains in his native Scotland. The native Aboriginals though, already had a name for it: Gariwerd. Hall’s Gap is the town closest to Gariwerd. 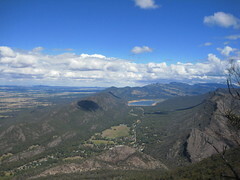 It is the starting point for many tourists who come to explore the Grampians. If and when you find yourself in Halls Gap, make the tourist information office your first stop. Here you can get a map of the various loookout points offering the best views of Gariwerd. Before driving up the long and winding mountain road though, there’s a couple more stops you need to do. First is a visit to the Brambuk the National Park and Cultural Centre. The area around Gariwerd has been home to the Djab Wurrung and the Jardwadjali tribe of Aboriginal Australians. The Brambuk cultural center preserves the history culture of is indegenous people in the centre through various exhibits. A must-watch before heading up the mountains are the two films shown at the centre’s Dreaming Theatre. The ‘Gariwerd Creation Story’ depicts the Aboriginal legend of Tchingal the giant emu and War the crow and the formation of the Grampians/Gariwerd mountains. ‘Gariwerd a Cultural Landscape’ illustrates the geology, flora and fauna, Aboriginal and European history and the various uses of the Grampians. The two films gives you a better understanding (and hopefully, better appreciation) of the area. The AU$5 (adult) ticket is for both movies. The Dreaming Theatre is not just a theatre; there are displays and models on each side of the room, and giant emu. The giant emu was enough to freak out two adults (me and my sister). Imagine how my niece reacted while the movie was playing, and the emu’s red eyes started glowing. My niece didn’t want to finish the movie anymore, so I was left alone inside the small theatre with the giant emu. Luckily, the lights remained off during the 2nd movie. With the giant emu behind us (but unfortunately, not forgotten), we hopped back into the car and drove back to Halls Gap’s centre for some ice cream. While enjoying my spearmint chocolate chip and Oreo cookie ice cream on waffle cone, I noticed the sign outside the ice cream shop. 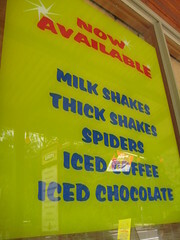 Now available, it says, are milk shakes, thick shakes and…spiders?! Noticing my apparent shock, my brother-in-law quickly explained that spiders is this drink wherein they put a scoop of ice cream on a glass of lemonade, much like a rootbeer float. Hmm, spiders. Must try that next time. Suitably cooled off by the ice cream, we got into the car and started the drive up Gariwerd. Excuse the cliche, but it really was a long and winding road. And we only went to the two nearest lookout points. We have been driving since 9am, and it was already 4pm by then. All of us were tired and well on our way to cranky. The views were worth the long drive though. You get a clear view of the tops of the other mountain ranges and the surrounding countryside. Exhaustion seem to fade away as you take in the beauty of the Grampians. Finishing with our day’s to-see list (and finishing off my camera’s battery), we drive on towards Horsham. As we were driving through the countryside, we have been seeing signs warning drivers of the presence of kangaroos in the area. I’ve never seen a kangaroo on the road, save for roadkill, so it was a bit of a thrill to see one standing off the side of the road. My brother-in-law slowed down the car to a full stop. The kangaroo, probably sensing that we were stopping to let him cross the road (maybe they’ve learned to stop, look, and listen before crossing the street? ), hopped on to the otherside. It was the perfect shot: the asphalt running a straight line, and the kangaroo with its perfect jumping form. And me on the front passenger seat holding a camera with a dead battery. To make it worse, there was a second kangaroo who crossed the road after the first, ensuring that you get a decent picture. Bah! Finally, we rolled into Horsham. We booked another cabin in a caravan park that I found online, but does not have a website. The caravan park was definitely much…rugged as our previous accomodation. Then again, there was a huge price discrepancy as well. Nevertheless, after a long day on the road, it was a welcome respite. Only one day left in this series, and one day left until the travel journal contest ends! Have you sent in your entry yet? Your articles make me miss Australia more than I already miss Australia! This was very well written, by the way. That Peter Moore better watch out, he’s gonna have some competition!